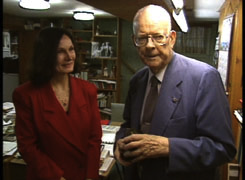 Dr. W. Edwards Deming is best known as the person who taught Japan about quality and helped change the face of that nation with his theory of management after they were devastated by World War II. 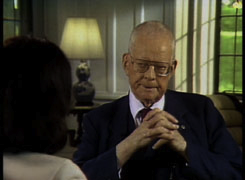 The Emperor of Japan recognized Dr. Deming's contributions by awarding him the Order of the Sacred Treasure, Second Class for meritorious service. 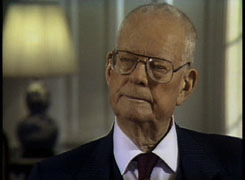 Each year in his honor, the Japanese Union of Scientists and Engineers (JUSE) awards The Deming Prize to Japanese companies that have "exerted an immeasurable influence directly or indirectly on the development of quality control/management in Japan" (from JUSE website). 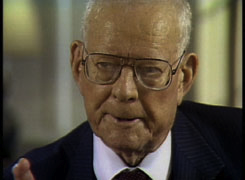 For the last 20 or so years of his life, Dr. Deming taught at New York University, consulted with corporations, and, several times a year, conducted intensive 4-day seminars that were typically attended by 500 to 600 people. The seminars were famous (or infamous) for their intensity and his uncanny ability to get to the heart of a problem instantly. He continued conducting these seminars until his death at 93. For the last year or so, he conducted the seminars from a wheelchair while his breathing was assisted by supplemental oxygen. Even under these circumstances, no decline in his intensity was noticeable. 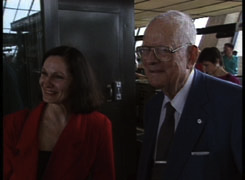 Priscilla Petty and Dr. Deming at Dulles Airport in Washington, D.C. as Dr. Deming prepares to leave on a flight to Los Angeles. From The Deming of America program, 1991. 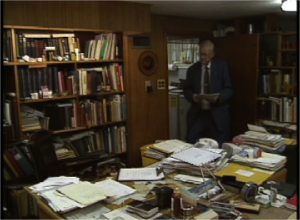 Dr. Deming, in his basement office, at his home in Washington, D.C. From The Deming of America program, 1991. 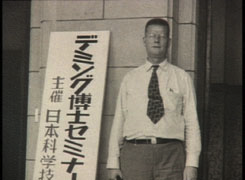 Dr. Deming, standing outside a restuarant in Tokyo, early 1950s. From The Deming of America program, 1991. 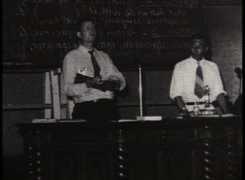 Dr. Deming, teaching in Japan, early 1950s. From The Deming of America program, 1991.